I scream for strawberry, you scream for chocolate. Either way, we all scream for ice cream! practise asking questions with this bar graph. Use an easy bar graph to find out what your classmates' favorite cold drinks are. Kids will get the chance to analyze data and colour in the bar graph. Discover the best picnic spots while learning the basics of creating a bar graph. Your child will learn about mode and data interpretation. 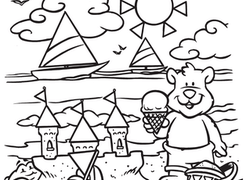 Learning about triangles is fun with this hidden shapes worksheet featuring a bear cub happily building a sandcastle at the beach. Practise reading Venn diagrams with some of the most popular summertime hobbies. Your child will learn to analyze and interpret data by answering questions. Do you prefer rivers, oceans, or lakes? Students will practise coming up with questions by analyzing the data given in this Venn diagram. Your student will use the colorful pictures to count the number of food items that were consumed and record the information using the tally chart provided. Great food never goes out of style. Find out what the most popular barbecue foods are with this bar graph that teaches kids how to interpret data. Students practise creating a Venn diagram by organizing the pool toys into the correct categories. Students will also learn to differentiate between shapes. Rock out with this pie chart! Enjoy learning how to make a pie graph and interpret data while answering questions based on the information given. How many animals have you seen on your hikes? Jake saw many animals on his! Create your own bar graph with the information given.